WE ENTER NOW an exciting new phase of spiritual demonstration. To inaugurate our active participation in a higher level of spiritual broadcasts, we will join in interdimensional conclave with etheric space forces in orbit over both hemispheres of our planet. Keeping pace with the current, lightning-swift transformations of individuals, groups and governments, we will renew our bonds with those bands of workers from the Federation of Planets who are assisting our preparations for the New Age of Aquarius. From his etheric headquarters aboard master ship #10, Sananda coordinates all aspects of the spiritual program, including the space phase. In its current planetary orbit, ship #10 is implanting special energies to secure necessary changes in all life forms on Earth prior to the Second Coming. Under Sananda’s direction are ascended masters who command numerous fleets of etheric and physical spacecraft for projections and demonstrations in specific regions of the globe. In psychic conclaves, we will link with two of Sananda’s major etheric commanders who are coordinating activities in both the Western and the Eastern Hemispheres: that is, Dr. Hannibal/St. Germain in the West and Summalt/Peter in the East. Through our hemispheric linkups we will play our part as special broadcasting channels through which these commanders can implant energies now to reinforce the peace, love and unification that are gathering momentum daily in this new cycle of demonstration. As part of the Hierarchy, both commanders long have maintained a special relationship to Sananda, our planetary ruler. For example, both were incarnated as disciples of Sananda in his last incarnation as Christ Jesus. Dr. Hannibal was Matthias, who replaced Judas, and Summalt was Peter. Our first conclave is with Dr. Hannibal. As etheric commander for activities in the Western Hemisphere, Hannibal is particularly concerned with coordinating and stepping up the vibrational rate of key light centers and individuals; that includes all of us of the light-worker network in the West. Hannibal’s area of influence encompasses North and South America, and to some extent Europe, because of that region’s close cultural ties with the West. Those of you who are in the Eastern Hemisphere also will be making the linkup with Dr. Hannibal, even though you may come directly under Summalt’s influence. For there are craft under Summalt who are coordinated with Hannibal’s mother ship in order to relay this exchange of energies throughout the planet. All areas of the globe constantly are covered by the etheric command in a vast network of energy relays for personal and planetary upliftment. “We are thousands upon this ship #1235; twenty-three hundred and fifty-three persons, to be exact. . . . We congregate on this etheric ship, which is the size of a city; as you understand it would be, to accommodate the comings and goings. “The purpose of this ship in orbit around your Earth is to stimulate and to work with all those who are being trained to be key light centers in the Western Hemisphere of the Earth. . . . We were put in orbit at the beginning of 1960, aware of the fact that we had to set up certain conditions and to stimulate certain persons by making connections. “We have many means of both what you would call electronic or magnetic controls; which are necessary for us to work with, because we have the capacity to manifest into another dimension. But we operate in the etheric or fourth dimensional sphere for the most part. All who are aboard this craft are capable of mind powers far beyond any that have been demonstrated on your Earth planet. . . .
“Each one is an individual. Each one has a different function. Each one has a different specialization. We work and are drawn together by Spirit and by the teachers that control and influence our experiences and developments, and were brought together to complement and to supplement each other’s talents and specializations. We were brought from many realms and dimensions and planets. . . .
“Even our ship is an experiment in time and space; . . . just as your group is an experimental group of forces and energies. . . . Sometimes we find it necessary for one to be removed or another to be brought in. We are not static. We do not have set ideas, in advance, of what we are and what we must manifest. We work by tuning in to the spiritual force within us and the spiritual force which is created by the group brought together. “Each one is assigned, in a sense, to a certain individual upon the Earth planet at this time. . . . We are in contact and communication, through our own high Self activities, with the high Self or the spirit within you. . . . According to channelings through Nada-Yolanda, Dr. Hannibal also conducts highly specialized energy projections, called hieronics, through a sister mother ship, designated #1236. Dr. Hannibal’s influence in the Western Hemisphere relates closely with his previous incarnation as Christopher Columbus. Explaining this on May 19, 1961, John Mark channeled: “It was Columbus, you must recall, who cemented the Western Hemisphere. It is part of his function, from many incarnations back and forth, to do this. He is in that group or band that works in hemisphere conditions, and will be instrumental in keeping the hemisphere intact from physical, mental, spiritual realms. He works with the forces of light and energy that control this particular function of the Earth planet. . . . In the development of spiritual and physical evolution on our planet, the Western Hemisphere always has expressed the active or male aspect or polarity, whereby man has developed material progress and has demonstrated physical control over the environment and all elements of the third dimension. The Eastern Hemisphere, on the other hand, has exemplified the passive or female polarity; hence its enduring development in mysticism, symbolism and esotericism. In order for mankind on the planet to express his full spiritual potential, both exoteric and esoteric areas of development must be explored and balanced. In fact, for decades the Hierarchy has inspired Western civilizations to achieve a higher understanding and appreciation of spirituality, and Eastern civilizations to become more active in manifesting physically their knowledge and progress. Hence, we have witnessed the growing interest in Eastern mysticism in the West and the spread of Western technology in the East. Part of our work as light workers, in either hemisphere, is to teach and to demonstrate this male-female, conscious-subconscious, positive-negative, West-East polarity balance within ourselves. But we also have group patterns to demonstrate for the planet. For example, as channeled by the Hierarchy, one of the functions of the Mark-Age Unit is “exemplifying that which is of the highest in spiritual growth in the Western Hemisphere and . . . exemplifying the understanding in the conscious aspect of that which is the political, sociological, educational and material factors of that civilization.” Now, other units in the East are setting patterns for that civilization. So, in our conclave with Dr. Hannibal, we want to emphasize the highest of Western ideals, understanding and balance. We want to put into action on the physical plane those positive, constructive thoughts and inspirations that will help transmute our planet spiritually. Due to the tremendous changes occurring in both Eastern and Western Hemispheres, we should readily see the need for holding a steady balance for the entire planet. Dr. Hannibal is a code name St. Germain uses in the space phase of the Second Coming program. In his high Self function, he is Chohan or Director of the Sixth Ray of Transmutation, and a member of the Saturnian Council. Much of his work, therefore, involves channeling hieronic energies into the planet to stimulate transmutation of vibratory frequencies from the third into the fourth dimension. As light workers, we act as instruments for these high-level electromagnetic transmissions to all life form. This guidance still holds. For have we not witnessed phenomenal changes in Eastern nations in the past several decades? And is it not vital that we continue to project for peaceful, nonviolent, nonjarring changes everywhere on our planet, in both hemispheres? So, let us be about our work for planetary balance. Let us join now in light-body consciousness with Dr. Hannibal. We decree that Spirit’s will be done for the highest good of all life forms. We offer ourselves as willing and able instruments for Dr. Hannibal and his forces to work through us for stimulating steady, stable, secure changes on planet Earth. Whether in West or East, we are one, for one planet of love. Etheric space forces enfold both hemispheres of our planet, East and West, with thoughts of love, peace, unity and brotherhood. In our second interdimensional conclave, we turn our thoughts toward the starship commander in the East, Summalt of mother ship #7423. In the same manner that Dr. Hannibal directs hierarchal demonstrations in the West for the Second Coming program, so our etheric brother Summalt directs the linking of lights in the Eastern Hemisphere. For those of you in the East, your meditations will be supervised directly by Summalt and hierarchal space forces under his command. For those of us in the West, our linkup with Summalt will occur via an energy relay or splicing technique through etheric and physical spacecraft under Dr. Hannibal’s command. Remember, our designation of East and West automatically incorporates all northern and southern continental areas as well; so, our anchoring and broadcasting of light blankets the entire planet. 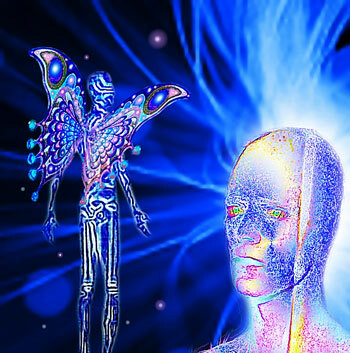 Although Summalt and Dr. Hannibal are involved with developments in their respective hemispheres, they also share energies, information and computerized data with one another in an exchange program that links all light centers and constantly feeds energy relays back and forth through etheric, astral and physical planes. This linking-of-lights network, coordinated ultimately by Sananda/Jesus from his master ship #10 and involving thousands of spacecraft, insures proper polarity balance in both hemispheres as spiritual awakenings, soul cleansings and changes are accelerated. Now, there have been occasions, such as in the early 1970s, when Dr. Hannibal and Summalt temporarily exchanged positions and orbited over the other’s hemisphere, in order to project supplementary energies that were needed to rebalance each other’s realm of influence. [See Visitors From Other Planets.] At that time, Hannibal’s projections in the East helped stimulate a more active application on the physical plane of the spiritual knowledge that had been developed there for centuries. Simultaneously, Summalt’s projections in the West triggered a more spiritualized and mystical understanding of man’s material development and physical conquest over the flesh. As we reviewed for our first conclave, the Western Hemisphere exemplifies the male or active polarity; man’s conscious, physical control over all elements of the third dimension; in effect, the pouring out of Spirit upon all flesh. One result of this polarity focus is that light workers in the West actively have utilized all modern technological methods to externalize and to promulgate the spiritual mass-educational program. This influence steadily has spread into the East, and we have seen a veritable explosion of interest in the spiritual program as further barriers to East-West unification have come tumbling down. There is an increasing hunger for the spiritual, New Age materials that the West has to offer. The Eastern Hemisphere, on the other hand, has developed the female or passive polarity, with its emphasis on spiritual mysticism, esoteric philosophy, and subconscious or soul development. Is it any wonder, then, that the world’s major religions all sprang from the East: Buddhism, Hinduism, Taoism, Judaism, Christianity, Islam? Consider Christianity for a moment. Although Jesus’ teachings have been thoroughly Westernized over the past two millennia, their roots run deep with Eastern mysticism, imagery and symbolism — a fact which metaphysical schools of thought in the West always have understood and have applied. An interesting corollary may be found in news reports on the spiritual renaissance that began to flourish in the Soviet Union and Eastern Europe in the late 1980s, due to the expansion of religious freedoms there. One point that was emphasized over and over was the strong religious faith that people had maintained in the face of decades of state oppression. When all trappings of religious power and structure were trampled, when churches were converted to atheistic museums, when religious instruction was all but banned, when persecution was the order of the day, all that many people had left was their faith. They were severely tested to sustain their faith in God’s laws and His ultimate deliverance. In this work, through his example as Peter, Summalt was able to infiltrate the receptive minds and hearts of many who had struggled to hold to the light and the truth. Another key to Summalt/Peter’s hierarchal role lies in the New Testament story of Jesus giving to Peter the keys to the kingdom of heaven. Summalt says this means that he is the doorkeeper between the astral and the etheric realms of this planet, and must approve each soul who enters the etheric realms, or heaven. He is responsible for teaching each soul about the Hierarchy and the roles of Sananda, which would include the patterns Sananda established on Earth in his incarnations as Moses, Elijah, Melchizedek, Zoroaster, Socrates, Gautama Buddha, and Jesus of Nazareth; plus Sananda’s role as Prince of Earth, Saturnian Council member, and Chohan of the Seventh Ray of Divine Love and Peace in this solar system. Concerning his mission aboard mother ship #7423 in the Eastern Hemisphere, Summalt and his Federation forces, through their spacecraft projections, are helping to decrystallize encrusted soul patterns and astral influences that are blocking man’s rise into etheric or Christ consciousness on Earth. As eons-old mortal thoughts, emotions and subconscious patterns are eliminated, influences from the unenlightened, lower astral planes also are removed. In effect, man’s consciousness is being raised into alignment with that of the higher astral planes and the etheric planes. This raises Earth into closer alignment with the other planets of our solar system, in preparation for rejoining the Federation. 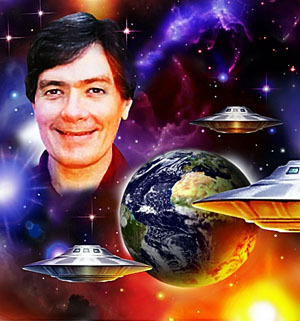 We must remember that much of the work of the etheric space program of the Federation of Planets involves cleansing and preparing the astral planes around Earth for the Second Coming; also, that the astral planes correlate with man’s subconscious and emotional areas of development, and incorporate karmic patterns that have been evolving in man’s soul record for literally millions of years. Naturally, this work with the astral realms and subconscious patterns of man is occurring throughout our planet and is not limited to a particular hemisphere. Yet, we can benefit from the examples that are developed for both polarities, East and West. In order for the influence of the I Am Self to be supreme, balance of the two polarities must be achieved, both within our own conscious-subconscious awareness and within our planetary society at large. On January 21, 1971, Summalt channeled information concerning imminent changes to take place in the East. We can view this as a prophecy that, in many respects, is still unfolding before our very eyes. [See Contacts from the Fourth Dimension.] Due to the transmutation that is occurring in the East now, Summalt’s guidance is still timely. And we can expect more momentous changes, for oppression and resistance still exist in many areas, such as in China, Myanmar [Burma], the Middle East, and parts of Africa, to name just a few. “The Eastern Hemisphere is going to go through a cleansing and a purification like unto which it never has experienced for several thousand years; that is, at least ten thousand to twelve thousand years of its experience. It has been solidified, crystallized and erroneously has been kept enmeshed in its own imperfections and past patterns which it had developed out of Lemurian evolvements. “Therefore, many souls are incarnated in the East in order to help bring about this preparation for higher understanding and for the evolvement into the spiritual program and plan that now take place upon the planet Earth. A great many will come into a higher crazed consciousness. By this I am admitting that many will appear to have gone off their track and their perfect balance in coordinating or in seeking a higher spiritual goal for themselves and the people who are involved in their environment and in their society. “This will take a great deal of balance for those who are in the Western Hemisphere who have become alerted to the spiritual program and the progress of the entire planet for evolutionary change into the fourth dimensional consciousness. They will be required, therefore, to help sustain this imbalanced condition throughout the Eastern Hemisphere in individuals, in national leaders and in entire group structures. “A great deal of upheaval will take place in the minds and in the political affairs and in the Earth patterns of those who reside in that part of the globe. . . . We now prepare you to project and to hold steady and to help in whatever degree you are led to do, either physically, mentally or in your own emotional understanding. In our meditation conclave, we link now in I Am consciousness with Summalt aboard ship #7423 in etheric orbit in the Eastern Hemisphere. At one with Summalt and his crew, we visualize peaceful change for all peoples, all governments, all nature forces in the East. We project for the unification of all peoples there, and for continued reconciliation between East and West. In support of the exciting new demonstrations of the dawning Golden Era, we visualize all people awakening to the Second Coming, of both the I Am Self within and the spiritual ruler of Earth, Sananda/Jesus the Christ. We also visualize renewed exchange with the interplanetary brotherhood, through direct contact with extraterrestrials. We join forces on all planes now for the pouring out of Spirit on all flesh. Adapted from broadcasts on Mark-Age Meditations (now I Am Network of Light) tape #460, for the weeks of 12/31/89 and 1/7/90, by Phillel. 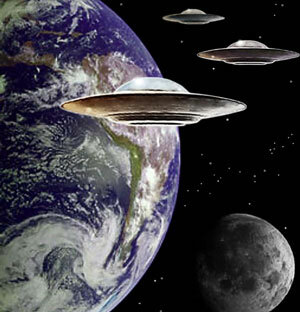 Photos: (1) Collage from NASA, plus UFOs by Hartmut Jager. 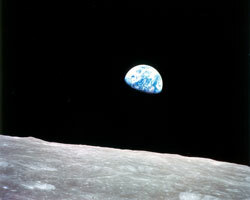 (2) Earthrise from Apollo 8 on 12/29/68, NASA Archives. 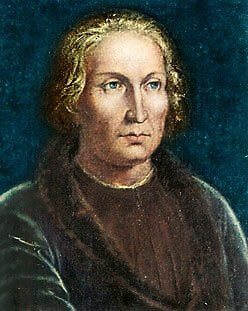 (3) Christopher Columbus, artist unknown; Naval Museum, Madrid (color-enhanced by Hartmut Jager). (4) Elsewhere © by Hartmut Jager. 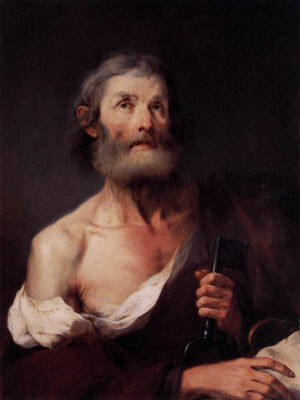 (5) Peter the Apostle by Giuseppe Nogari, 1743. 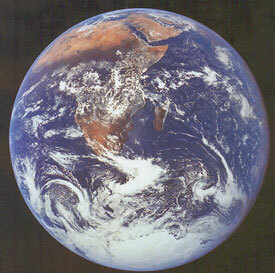 (6) Earth, NASA Archives. This is indeed a very special and most profound time for all of us. What a privilege to be here at this time. What examples our way showers are for us. It is a humbling and loving experience. The love and care and sharing fill the heart too with love and the need to cherish every moment. We are blessed indeed. True sons and daughters of the Most High Living God! So be it. Timely and significant information, coming during this crucial time of new changeovers, beginnings and resurrections. Thanks!